Well, 2018 is almost over, and it's on to 2019. And with the new year comes Mysterion's first 2019 submission period. If you have any stories you want to submit, now's the time to get them ready. We look forward to reading them starting in January. I'm probably not the best person to give marriage advice. I'm not a psychologist or marriage counselor, and I've only been married for seven years and we don't have kids. This article got me thinking about marriage, though,and in particular what advice the church can give about marriage. I think that a sermon series on marriage and relationships could be very useful, but in my experience, churches are terrible at giving practical advice. They tend to over-spiritualize every question, falling into deep theological wells about complementarism and egalitarianism rather than giving practical advice. So here I thought I'd give practical advice on a frequent source of conflict in marriage: finances. And to that end, I'll tell you what works for me and my wife. The first rule of advice is that works for one couple may not work for others. Talk things over with your spouse and decide how you want to do things. Make sure you agree. I'm not giving advice about how to balance your budget or pay your bills. If you can do that when you're single, you can do it once you're married. I'm focusing on a much more contentious question: how do you share? Many couples share everything: what's yours is mine and what's mine is yours. Every penny we make goes into a joint account, and every penny we spend comes out of it. Which is great, as long as you agree on every single expense. Often you will not. Sometimes my wife wants a fancy dinner, and I want an Xbox--and they cost the same amount. To me that sounds like an extravagant waste, while my wife thinks something similar about the Xbox. She'd never use it, and how often would I really use it after the first month? What often happens is that each person feels the other is being wasteful with their money. It's not uncommon for one partner, usually the one who makes the most money, to start putting restrictions on the other. No, you can't buy that, we can't afford it when we need groceries. Another option is to keep separate accounts. My paycheck goes into my account, your paycheck goes into yours. Everyone has their own stuff: their own car, their own Xbox, their own meals. Joint costs are split, more or less evenly. That can also work, but what happens when one of you makes a lot more than the other? What if she can't afford to pay half the rent on the nice place close to his job, and starts to resent that he's driving a Mercedes while her clunker is giving its death rattle. What if he loses that job and his savings start to run low because he spent it all on the fancy car? Sure, she'll cover him for a few months, but how long until she starts to resent that he's living off her money. Now it's not impossible to make either of those work, given common levels of frugality or income, but I'd like to propose another way, and it's the one my wife and I use. All income goes into into a joint account, from which all household expenses are paid, plus each of you get a personal account. Each person gets a certain amount in their personal account each month, and can spend it however they want. The amount can be fixed, or a percentage of each paycheck. My wife and I tend to each get 5-10%, depending on what we feel we can afford at the time. It's important that each person gets the same amount, no matter who's making more money. This helps to avoid feeling that that it's my income or your income. It's our income, and our money, we simply designate a certain amount for each individual's personal use. Joint expenses are just that, joint. You have to agree on joint expenses. Most are easy: rent or mortgage, bills, groceries, kids. But if it's ambivalent, or it's expensive (we set a threshold of $200) and not something you've already agreed to, such as groceries or the mortgage, then you have to decide on it together. If you agree, great. But if not, that's not a no. It simply means you have to save up before you can pay for it from your personal account. Modern finances being what they are, you'll also need a joint credit card and personal credit cards. Personal credit cards are paid off from the personal account, and the joint card is paid off from the joint account. We've found this arrangement to work very well. The lion's share of our income goes to the joint account, and we spend it on necessities, or things we both enjoy, and save when we can. But we each have a fund we can draw on for things we want, without the need to worry about what the other person would think. It's also the fund we use for date nights and gifts for each other--it's more meaningful when it's our own money. Speaking of date night, at this point of our relationship we switch off, alternating who pays for the date out of their personal account. That person also gets to plan the date. That way they get to decide how expensive it is, as long as they're willing to pay for it, and they can also pick the activity. Often it's not something the other person would have picked on their own. We typically don't drag each other to activities we know the other person will hate, but we also try to be a good sport about trying things. So that's what works for us. It won't necessarily work for everyone. And when money's tight, what is and isn't charged to the joint account may be a point of contention, and you may need to budget even the stuff you agree on carefully. For example, is there a limit to how much you can spend on groceries from the joint account? How about clothes or toys for the kids? But even then, it's nice to have a little money you can spend for yourself. As a general rule, I don't review anthologies and magazines that I'm in. 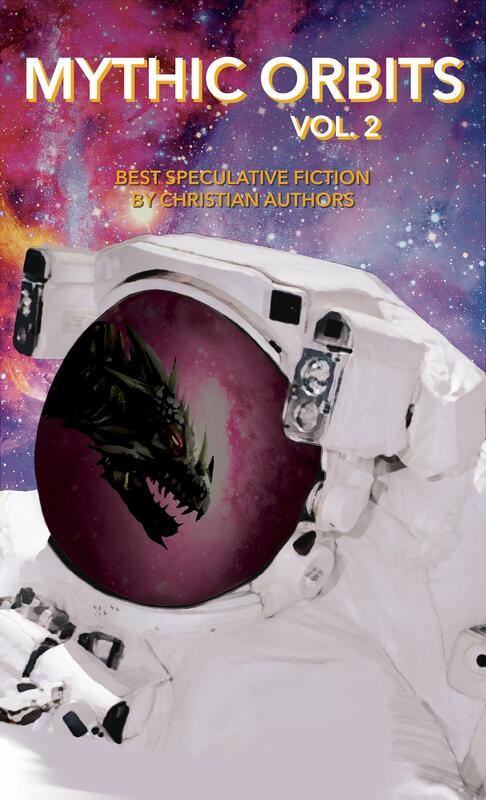 Kristin and I both have short stories in Mythic Orbits 2, the second volume of Bear Publication's collection of speculative fiction stories by Christian authors. My story, "Her Majesty's Guardian," was a very short piece originally published by Daily Science Fiction. It asked the question of how a magic society would deal with a royal family with a genetic predisposition toward madness and a ridiculous amount of power. Kristin's story, "The Workshop at the End of the World," is a more whimsical tale involving elves, and to say any more about the premise would be to spoil it. It was also published in Daily Science Fiction. We're very proud of both these stories, of course, but like I said, I don't review books that I'm in, and I especially don't review my own stories, or Kristin's. But I would like to talk about some of the other stories in Mythic Orbits, and mention a few that really worked for me. My favorite was "Mark the Days" by Kat Heckenbach. Denver begins to live his days by the order that he marks them off in his calendar. He takes advantage of this, skipping over days and coming back to them later, when he can take advantage of knowing what the following days bring. But slowly he comes to realize that there is something terrible waiting for him on the one day he skipped at the beginning, and eventually he won't be able to avoid it any longer. I felt that this story was successful in creating a rising sense of tension, and showing how someone might deal with knowing the future, while fearing to know the past. Another story I really enjoyed was "They Stood Still," by William Bontrager. Anyone who uses a computer knows the frustration that happens when the computer freezes, and you're afraid to do anything, in case that makes you lose all your unsaved work. This story imagines what would happen if the whole world stopped. Samuel, who lost his legs in Iraq, suddenly has to deal with a Las Vegas empty of all motion except himself. I thought this story really dealt with his dawning horror, and the fear that he would never interact with anyone or anything ever again. I didn't feel like the story quite stuck the landing, however. I would have preferred a deeper meaning to this event than what we received. Less grim was "Unerella" by Keturah Lamb. This tells the story of the other young woman at Prince Charming's ball, who has to figure out her own way when Cinderella steals his heart. There's nothing really twisty about this story, once you figure out that it's not from Cinderella's point of view, but I enjoyed the determination of a young woman who had to learn to dream something new. "The Other Edge" by C.W. Briar was a particularly memorable dark science fiction tale. Astronaut Varik Babel leads his crew to make first contact with a ship from another world. What he finds is not what he's looking for. I did find the ending somewhat implausible, given what I know of the technologies involved, but it was horrifying even so. "Dragon Moon" by Linda Burklin was a bittersweet story about Darla, a young woman who slowly covers herself in tattooed scales to entertain and distract her younger brother, who's dying of cancer. While I can't imagine someone doing that--I kept thinking that she must be crazy to do so--it brought out the depth of her love for her brother. The fantastical ending to this story was dramatic and appropriate, but I felt that the denouement too easily canceled the price that Darla had paid. These were the stories that really drew me in and which I found myself thinking about days after reading. 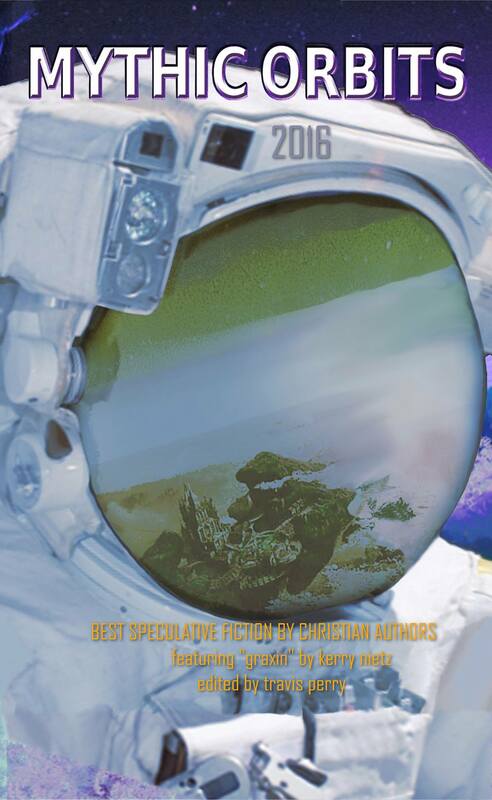 But our experience of stories is subjective, and I suspect other readers might find themselves reliving some of the other stories in this anthology, such as that of the mother bear searching for her lost cubs, or a curator explaining Earth culture to his alien overlords, or a failed Mars colony recalled to Earth, or robots replaying forgotten memories. I think most people will find something to enjoy in this anthology. Perhaps even a story about a queen's guardian, or a workshop at the end of the world. I recently finished Bard's Tale IV, the thirty-years-late sequel to the Bard's Tale Trilogy. I first played these games back in the mid-80s, on a monitor with CGA 4-color 320x200 graphics. Considering those limitations, they seemed like surprisingly good graphics at the time (see the original in emulation here). I've since upgraded to an nVidia GTX 1080 Ti with 16.7 million colors at 1920x1080. 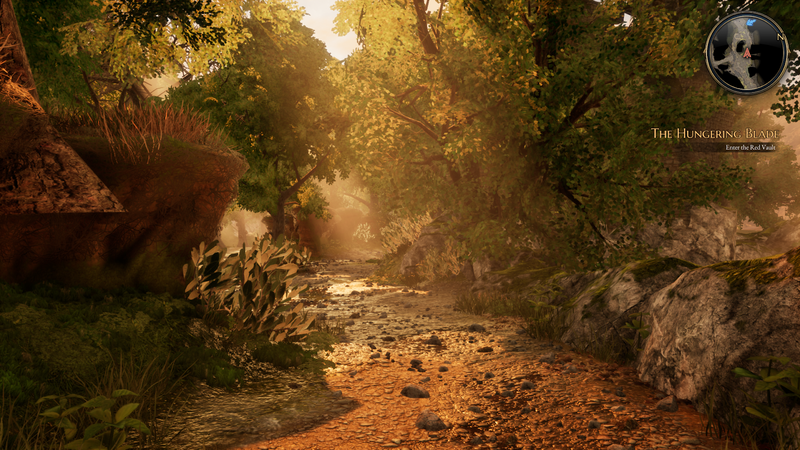 Fortunately, Bard's Tale IV upped it's graphics game as well, as you can see below. Skara Brae Below. Honestly, this is probably the best looking part. The graphics are overall pretty good, but this is a Kickstarter supported game built by a small studio, so it's not exactly the realism that you'd expect from an AAA game from a major developer. In particular, the character art is a little cartoonish, and the dungeons--and of course there are dungeons, the original Bard's Tale bragged about its 16 levels of dungeons right there on the box--do take on a certain amount of sameness after a while. There's just not a lot of variety in stone walls. 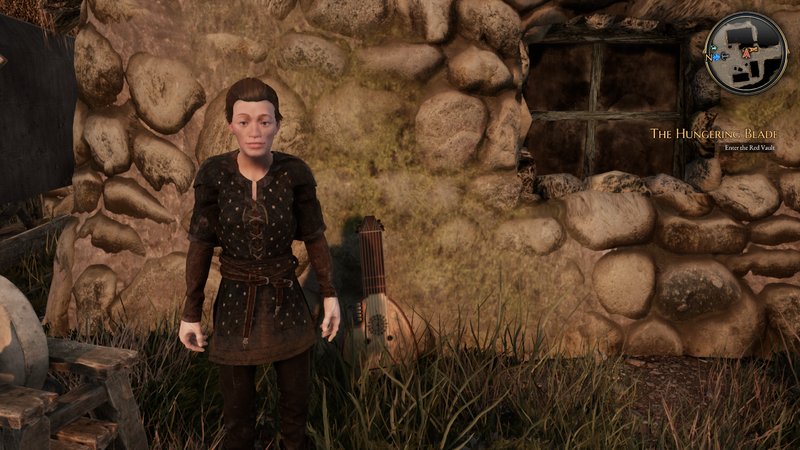 Character models can be cartoonish. But for all that, there are some standout visuals. The dungeons of Mangar's Tower and Kylearan's Tower early on (both reprises of dungeons I explored in the original Bard's Tale), and the few Dwarven dungeons, can be quite spectacular in places. But the best looking areas are in the wilderness. 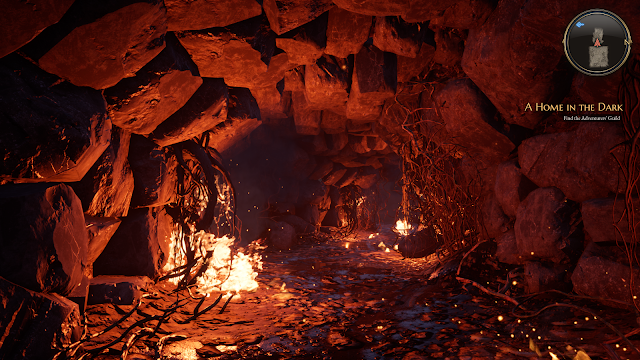 For all that Bard's Tale IV is a dungeon crawler, there's a lot of wilderness exploration--which to be honest, are merely another type of dungeon, with impassable underbrush substituting for stone walls. Some of the best visuals are in the outdoor areas. Much more entrancing than the visuals was the music. 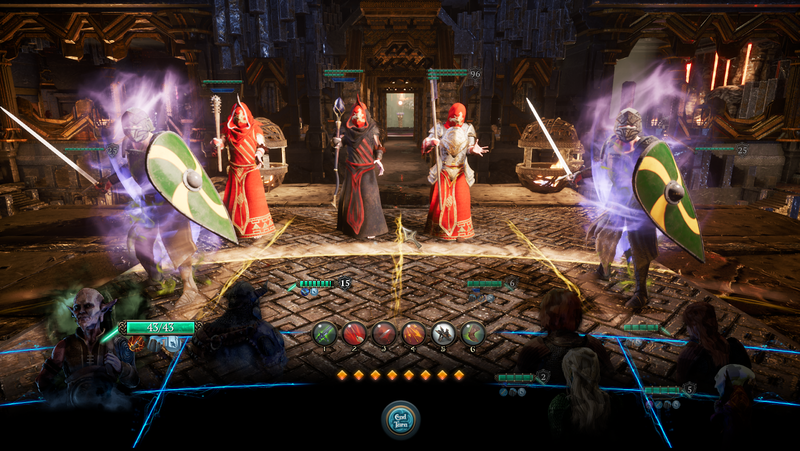 As you might expect for a game like Bard's Tale, there's a lot of it. NPCs are constantly singing--performing, or in groups, or just singing to themselves. Most of the music in Bard's Tale IV are traditional Scottish songs, and I occasionally stopped what I was doing just to listen to someone singing. There's a songbook with translations of some of the songs, but I wouldn't recommend it. The songs aren't always a great fit for the setting. There are four songs in English, one about each of the games, including this one, which contain important clues about certain related dungeons. I don't judge games purely on their music, or their graphics, or their technical excellence. I judge games primarily by how obsessed I am with them. For all Mass Effect Andromeda's faults, that was a game I played straight through from beginning to end with barely a break. And while Divinity: Original Sin and Original Sin 2 are great games, I find myself drifting away from them for months at a time. So what got me so into the game? Part of it was the lore. Many people complain that it doesn't contain really great storytelling--which I won't argue against. But it did have better storytelling than the original Bard's Tale games (basic plot: an evil wizard has shown up and is causing trouble, go kill him), and more to the point, it gave those stories context and made them part of a bigger world, explaining why Skara Brae was so often the target of evil wizards. The other part was the puzzles. The original Bard's Tale games had a lot of puzzles in how their dungeons were designed, with spinning tiles, teleporters, riddles, and all sorts of things that only really work when the graphics are simple and the perspective is fixed. Bard's Tale IV has a whole new bag of tricks when it comes to puzzles. It does have some of the "find the right item to gain access to an area" puzzles typical of RPGs, but there are also codes you have to figure out, blocks you have to slide into position, fairies you have to guide, and Dwarven gear mechanism puzzles. And each type of puzzle builds to more complex variations as the game progresses. Even combat is its own form of puzzle. Combat on an 8x8 grid. Combat takes place on an 8x8 grid, with the heroes on one side and the enemy on the other. Different abilities affect different squares in front of the character who's acting, so moving characters into the correct position, and forcing the enemy to move, is an important part of combat. Spells and attacks always hit and do a fixed amount of damage, depending on the ability and the character stats, so there's not really a lot of randomness to combat, except for crits and certain riders which do depend on probability. There are a couple of clever innovations which really make combat interesting. The first is opportunity points. Almost every action requires opportunity points, but this pool is shared. If your fighter is best positioned to do damage, then he can use all the opportunity points to dish out damage. Similarly the rogue can use the opportunity points when the fighter's abilities are on cooldown or not really useful for the situation. The second innovation is how spell points are implemented. Spell points are generated starting when combat begins. Depending on how you build your character, they may gain spell points every round, or meditate or drink potions for extra spell points, or use a stance that increases spell point generation. Bards are the exception to this. While they can gain spell points through potions, they mainly gain spell points through drinking. A bard can drink alcohol to gain spell points and stacks of the drunk condition. More stacks of the drunk condition can cause bard songs (their versions of spells) to have extra effects, but drink too much (more than the bard's intelligence), and they pass out for a round. Bard songs tend to focus on buffs and debuffs (including generating spell points) rather than direct damage. Practioners (the generic name for magic users) can buff, force enemies to move, summon, and do direct damage. Spells and bard songs don't require opportunity points to use, so they form a separate pool of actions bards and practitioners can perform, but many of the ways they gain spell points require opportunity points. It gives the combat an interesting mechanic, where practitioners and bards need several rounds to build up to their most powerful abilities, while the fighter and rogue (and bard, who can drink and fight at the same time) hold the line. Another, not entirely novel, piece of the combat puzzle are damage types. There are three types of damage: normal, mental, and true. Normal damage can be blocked by armor, so if you're using normal damage you either need to do a lot of it to overcome the armor, or you need to first remove the armor, which you can do with certain abilities and items. Mental damage can bypass armor, and it also attacks focus. Enemies, and you, need to focus to perform certain actions, which require you to wait until your next turn to complete them. Meanwhile, you have a focus bar, which has a number of points depending on your intelligence. Mental damage affects the focus bar first, and if the enemy destroys all your focus, the action is canceled, so focus limits certain powerful abilities, and attacks that do mental damage allow you to interrupt your enemy's attempt to use those abilities. Finally, there's true damage. True damage bypasses both armor and focus. There are four basic classes in the game. Bards have bard songs, but also a lot of combat capabilities (many of the same ones the fighter has). Rogues tend to be straight damage dealers with a lot of tricks. They're the only ones who get extra damage from critical hits (other classes recharge abilities or gain spell points). Fighters also deal decent damage, but also have abilities that draw enemy fire and protect their allies. They have the best defense in the game, and can use the best armor. Practitioners can have a lot of variety, with lots of different types of spells, and specializations--and you can specialize in all the specializations. You need to specialize in at least three of them to become an archmage, which gives you a large collection of powerful spells. Every level, a character gains a skill point, and can use that to buy one skill in a skill tree. 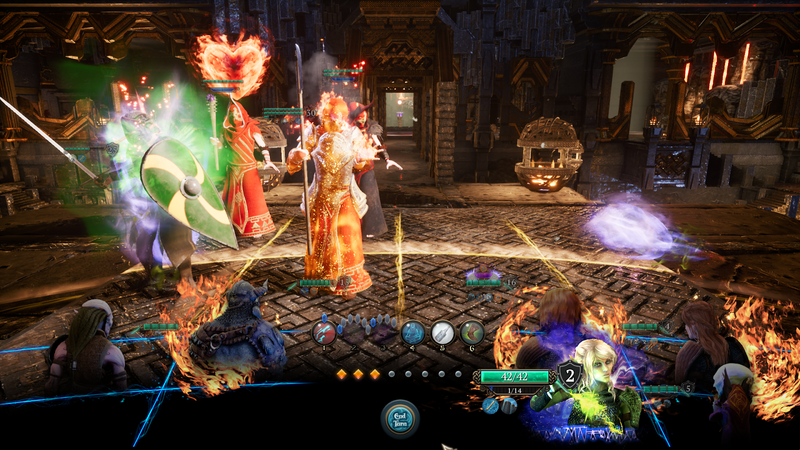 Every class has at least four categories of skills, most of which contain several skill trees. Everything in the game requires buying skills. Skills let you wear better armor, give you powerful combat abilities, let you craft potions and brew drinks, teach you new spells and bard songs, and provide straightforward stat bumps. As you move up a skill tree, you sometimes close off other paths, but you gain more powerful skills, including a capstone that can give your party more opportunity points, or start everyone off with an extra spell point, or mark enemies you hit with spells with an explosive mark that damages it and nearby enemies the next time someone hits them, or allow you to absorb your allies' damage, or start everyone off concealed. And here is where, in the late game, combat tends to break down, as these powerful capstones combine to become too powerful. If you start out concealed, then you can take a round or two to build up your spell points, and then, before your enemy attacks, you can hit them with your most powerful spells. In the late game, you can end most combat encounters before the enemy gets a chance to act. It's fun, at least for a little while, to completely dominate your enemy, but eventually it starts to wear thin. I suspect that the developers will nerf this particular ability in future updates. When your entire party starts out concealed, you can buff and charge up spell points for a combat-ending surprise attack. Speaking of updates, the game was very buggy when it came out. Things like the rogue's critical hits doing less damage rather than more, occasionally not getting experience for battles, the inability to click on necessary items in the game world, or becoming stuck in the landscape. The bugs have certainly been reduced since the game was released (reduced damage on a critical has since been fixed, for example), but there are still quite a few. Despite these issues, I very much enjoyed the game. It's been my favorite since Mass Effect Andromeda, and I'm hoping for more like it. This is a guest post, posted as part of the Mythic Orbits blog tour. Kristin and I are both in Volume 2 of Mythic Orbits. You might be wondering what in the world “Mythic Orbits ” refers to. I’m not sure if it will help reassure you to tell you the name Mythic Orbits was simply intended to suggest both science fiction and fantasy and to identify these books in a distinctive way, along with any that follow after in the series. Just as these anthologies represent a wide variety of genres, there is no common theme to these tales, though the subject of empathy or lack thereof does come up in them repeatedly. 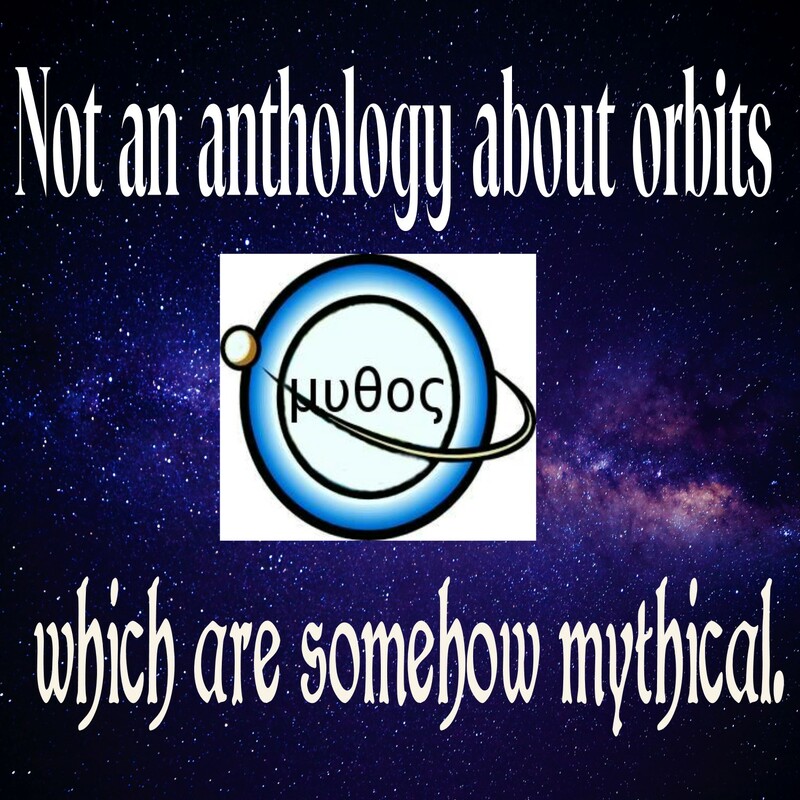 This is most definitely not an anthology about orbits which are somehow mystical. Especially when we're talking about theologically conservative Christians, Evangelicals of some sort, professed Bible-believing Christians, do people know about their works? 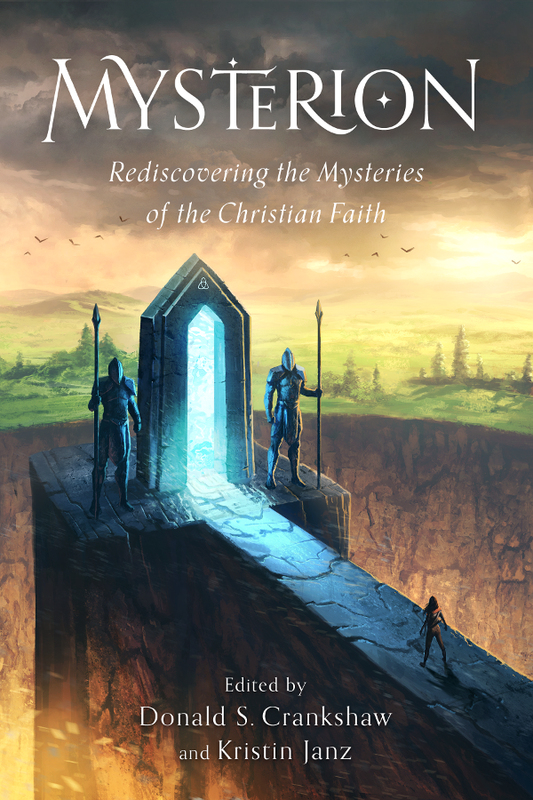 Is it legitimate for people to wonder if writers with personal convictions along these lines produce speculative fiction, that is, science fiction and fantasy and related genres like LitRPG, paranormal, and horror? 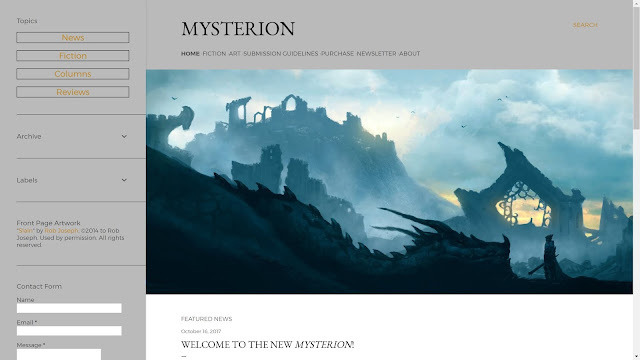 Yes, Mysterion has gone online. 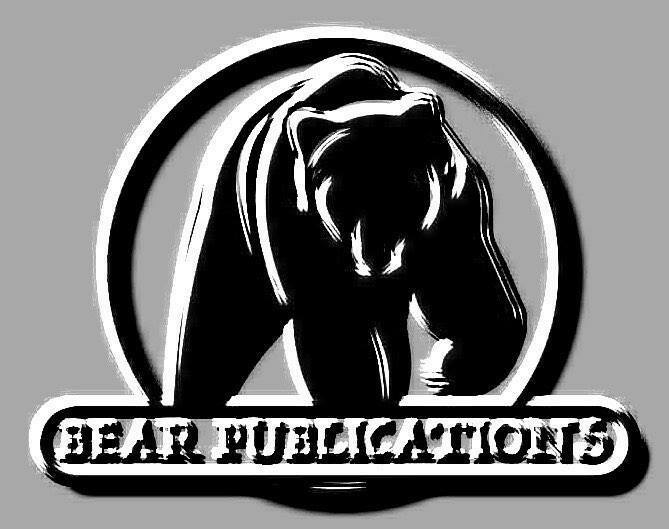 We'll be publishing reviews, interviews, and columns, starting in January, which is also when we'll open to fiction submissions to start publishing later in 2018. Our Kickstarter has reached its end. While we reached $4183 in funding, that was short of our $5000 goal, which means that we don't get any funding, and Mysterion 2 won't be happening any time soon. Don't worry, though. We do have a plan B. We also have some lessons learned, which we talk about here. Our Mysterion 2 Kickstarter is in its last hours, with 57 left. As we're only 56% funded it looks like we're not going to make it. There's still time to contribute at www.mysterion2kickstarter.com. 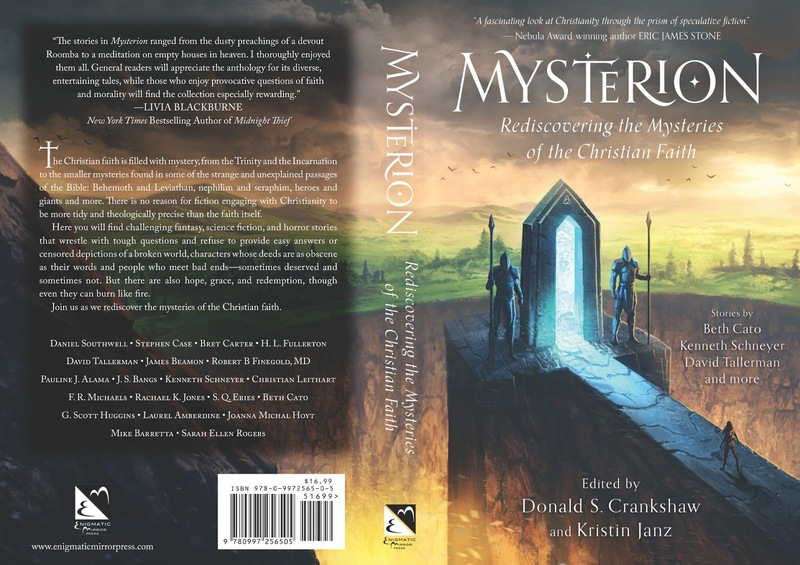 Kristin and I are proud to announce that the Kickstarter for the second volume of Mysterion has launched. You can watch the video below to see us awkwardly reciting our lines. Or you can just follow the link. So I've been watching Gotham for the past three years. It can be a fun show, a cross between a police procedural and a comic book show. Early seasons leaned more to police procedural, with the crimes being more gangster related, than the superscience and mystical villainy of the Batman comics. It slowly moved toward more aggressive comic book characters, and we've now seen such iconic characters as the Riddler, Mr. Freeze, Penguin, Firefly, and the Joker. But there have been times when I think it's been too slow. Because let's be honest, the reason we watch Gotham is because we want to see Batman. Bruce Wayne has been in the show since the beginning--the series began with the murder of his parents. But since he was only eleven or twelve when it happened, he wasn't exactly going to be Batman right away. In most portrayals, we start with Bruce's parents' murder, and then skip ahead a decade or so, to after Bruce has traveled the world, training with world-class experts to become the best at absolutely everything: martial arts, investigation, driving, inventing, even developing esoteric skills such as meditation. But in Gotham, we watch him grow up. Rather than being trained by experts around the world, his principal teacher is Alfred--though admittedly, this version of Alfred is former SAS (British special forces), so he's taught Bruce how to fight. Bruce has also been hanging out with the young thief Selina Kyle, the future catwoman, and even stayed with her for a while so he could learn about thieving. Exactly how long is never stated--it was several episodes, which could have been anywhere from a few days to a few months. It was at least long enough to learn to pick locks, which he seems to be fairly proficient at these days. Finally, one of Ra's al Ghul's lieutenants, the Sensei (who's actually al Ghul's father in the comics, though that's never stated here) briefly kidnapped Bruce, primarily to brainwash him, though there was also some martial arts training involved. Anyway, Gotham's always been interesting, but the end of Season 3 threw away the slow part. A lot happened, with Jim Gordon, Selina Kyle, Ra's al Ghul, but the most important development was with Bruce Wayne. Bruce has finally decided to become Batman. Well, not Batman specifically, but a vigilante, fighting criminals. On the one hand, this seems like it's too soon for Bruce to become Batman. On the other hand, we've been waiting three years for this to happen, so lots of people (like, the whole Internet) is excited to see this. The rumor is that the showrunners didn't think that Gotham would be renewed, and wanted to end the show with everyone moving in the right direction for their ultimate destinies. It looks like they did too good of a job, and everything's now moving way more quickly than before. It will be interesting to see if they can keep up the momentum. That doesn't change the fact that Bruce is not ready yet. He knows how to fight, obviously, and he's learned some of the sneaking and thieving skills he needs, but he's clearly not the polymath that Batman is, so it'll be interesting to see how things develop. To some degree, I expect the next season to have a Batman Begins or Batman Year One vibe, as he slowly develops the arsenal of gadgets and techniques that Batman uses. But in both those stories, Bruce Wayne already had the skills. He just needed to work out the method to use. Here, I think Bruce also needs to learn what he needs to learn. This will happen as he runs into challenges in his vigilantism he can't overcome with his current skillset. When he does run into those, he needs to figure out how to get the skills he needs. Obviously, Alfred will continue to teach him how to fight. He also may teach him more Batman skills, such as fancy driving, throwing weapons, rock/building climbing, etc. There are also other experts in Gotham who could help train Bruce. The first time his vigilantism requires Bruce to solve a crime, not just interrupt one, he could turn to his friends in the GCPD, especially Lucius Fox, to help him not only solve the crime, but to learn how crimes are solved. In the movies, Lucius is also portrayed as the source of Batman's gadgets (more so in Batman Begins than the comics, where most of Batman's gadgets are invented by Bruce himself). Here I expect him to not only provide gadgets, but to teach Bruce about science and inventing. Jim Gordon may also help in developing some of the investigation skills, though unlike Lucius, in most continuities he doesn't know Batman's identity. Selina Kyle is still around, though her current relationship with Bruce is frosty. Still, when it comes to sneaking and breaking into places, there may be more teaching that she can provide. Then there's Ra's al Ghul, who showed up in the season finale as the true force behind the Court of Owls. Ra's wants to make Bruce Wayne into his heir to lead the League of Assassins, and the fact that Bruce was able to overcome the League's brainwashing just makes Ra's more intrigued. Bruce doesn't want to be al Ghul's heir, of course, but that doesn't change the fact that Ra's is willing and eager to teach Bruce all sorts of the ninja-like skills Batman needs--from sneaking around, to impossible feats of agility, to martial arts mastery, mystical mumbo-jumbo meditation, and throwing stars (aka proto-Batarangs). This was the path that Batman Begins took to show how Batman got his skills, so closely does al Ghul's teachings match what Batman needs to know. I fully expect Bruce to undergo some significant training at Ra's's hands, either willingly (perhaps in an attempt to infiltrate his organization, perhaps because he realizes he can't do this without it) or unwillingly. Finally, it's not unusual for Bruce and Alfred to leave Gotham for months at a time for vacations. It wouldn't be out of line for such vacations to become cover for some intensive training of one type or another with an expert that Bruce learns about, or Alfred knows through his contacts. It's possible that some of those trips already involved more than visiting a ski lodge. I'm not expecting a full-fledged Batman next season. Maybe if they think the show's going to be canceled again, they'll give it to us in the series/season finale. Otherwise, what I expect to see is Bruce slowly learning what he needs to know to be Batman, developing the tools and techniques and skills he needs, and possibly learning that he needs something more. Not just more training, but an identity, an icon, to make him something more than a viglante: a symbol. John Hawthorne had noticed this post of mine, where I link to an article on twenty untranslatable words in other languages. Have you ever found yourself struggling to find the perfect word? You have an experience that feels so…so…but no words exist. You want to insult someone but can’t find a word vicious enough. You want to speak words of tender affection to your partner but no such words exist in the English language. Thankfully, there are other languages we can turn to in our time of need. Here are 25 [actually 35] amazing foreign words that don’t exist in English. Use these words when English fails you. I mentioned in my previous post that the biggest issue I had with Iron Fist wasn't the fight scenes or the slow pacing, but the business decisions. I think this showed ignorance more on the part of the writers than the characters, so I feel that these questionable decisions are worth discussing. The first one is that Rand Corp has developed a drug that is a cure for a deadly disease. It works wonders, and due to manufacturing efficiencies, they can produce the drug at $5 a dose. Ward Meachum wants to charge $50 a dose. Danny protests that if this drug saves lives, they should sell it at cost. He doesn't seem to realize that doing so doesn't mean they'll break even. It means they'll lose hundreds of millions of dollars. The cost of drugs isn't in the manufacturing. It's in the years of research and development and FDA trials and failed drugs that never made it to market because they didn't make it all the way through the process. That's hundreds of millions of dollars that Rand Corp spent to develop this drug that they won't make back. Money that they won't have to spend on R&D, which the show specifically mentions is something they want to do with the profit, so there won't be any cure for the next epidemic. And yes, maybe at the margins there would have been people who couldn't afford the drug at $50 a dose, but the show even says that the World Health Organization would have subsidized purchase of the drug in poorer regions. And it's not unheard of for drug companies to sell drugs for lower prices in poorer regions in the world, while still making a higher profit in the rest of the world. In another case, some cancer victims are suing Rand Corp because they believe that the company's chemical plant on Staten Island gave them cancer. The problem is they don't have any evidence. The plant's emissions are all within government limits, and the plant has passed every inspection. As far as anybody can tell, Rand Corp is doing everything it can to run a safe plant. The plaintiffs' only evidence is that 15 people living within a one mile radius of the plant have gotten cancer. Only, wait, how many people live within a mile of the plant? Is 15 cases of cancer a lot for that many? Well, we don't know exactly where on Staten Island the plant is, but according to Wikipedia, Staten Island has a population of 474,588, and a population density of 8,112 people per square mile. So within a one mile radius of the plant, there'd be about 25,000 people. According to this website on cancer statistics, over 450 out of every 100,000 people will be diagnosed with cancer each year. So out of any population of 25,000 people, you'd expect 115 cancer diagnoses. Unless all those people have a specific, rare type of cancer that can be traced to something the Rand plant produces--none of which is even suggested--then if those are the only people with cancer, something in that area has caused an 87% decrease in the rate of cancer. Rand Corp has cured cancer! I don't blame Danny for not getting this. He spent the last fifteen years in a monastery, and that sort of communal lifestyle typically doesn't operate on capitalist principles or teach basic statistics. But what bugged me is that no one could explain to Danny the simple math of these situations, instead telling him that his ideas were bad business or that they weren't how business worked. Yes, this is true, but he needed to understand why they were bad business, and no one could be bothered to do that--or possibly, none of the writers of the show understood economics any better than Danny did. It seems that all I talk about recently is Mysterion. Well, let's get back to the other thing this blog does these days: geeking out about tech. I've been thinking recently about getting a new tablet. Currently, the only tablet I have is a 7" Amazon Fire. Which is great for consuming content, but I was thinking it was time for something with a little more meat. I don't intend for this to be a primary productivity device for me. I have a laptop for that, which I'm quite fond of. So the tablet would still be a media consumption device. But I would like it to be at least a little bit more capable of productivity. I now have an official work laptop (a Mac Powerbook that I'm not crazy about--but that's because I have a bias against Macs), and I don't feel like I can take two laptops to the office. But I often miss having my personal laptop when I have to stay late or I'm traveling and want to do personal stuff, such as writing. You can get keyboards with plenty of tablet devices, so that seems like it could be the way to go. I also would like something I could get LTE access with, so I'm not always tethered to WiFi. That is the Lenovo Yoga Book. It's internals are nothing to write home about: Atom x5 processor, 4 GB RAM, 64 GB storage. The screen is 1920x1200 LCD (I really want an OLED screen, but that's not available). Fortunately, it does allow you to add microSD storage up to 128 GB, and it apparently does have LTE. What's really interesting is that it has a keyboard--sort of. Its Halo keyboard is actually a touchpad with haptic feedback. I'm not sure how easy it would be for me to type on, so I wouldn't want to use this for my primary productivity device, but it could be good enough for those times when I want to spend a little time writing. What's most interesting is that the touch keyboard transforms into a writing surface, like a Wacom tablet, that records what you write or draw. I'm not much of an artist myself, but I do like paper notes. It also comes with the option of either Android or Windows 10. I like Windows 10, or at least prefer it over Windows 8, but Android is better for media consumption, in my opinion. At the very least, Amazon allows you to download videos onto Android, not Windows. For productivity, the one thing I'd really miss with Android is that Scrivener is not available for it--yet. Scrivener is my primary writing tool, and I'd really like to be able to use it when I'm on the go. But the iOS version of Scrivener just released, and I know they've been working on the Android version, so I'm hoping that the Android version will be available some time in the next year. So I'm definitely considering this device. I'll probably wait for reviews before shelling out $499 for it, though. Mysterion: Rediscovering the Mysteries of the Christian Faith was released yesterday, August 31st, and you can now buy the anthology as an ebook and paperback at Amazon, and as an ebook at iTunes, Barnes & Noble, and Kobo. The paperback is $16.99, the ebook $9.99. We hope you enjoy it as much as we did. And once you read it, consider writing a review. I've been busy on the anthology recently (we're in the process of editing the stories now, and it's taking a while), so I haven't had much to post here lately. But in the meanwhile, I have a story out in Andromeda Spaceways Inflight Magazine #62. "Marked Man" is a weird western about what happens when the past catches up with you. The story comes with a cool piece of art in the magazine. Heath knew the look of a man who meant to shoot another. There was no mistaking it in Eustace’s eye, so he drew his own weapon. No man could draw a gun faster than another could pull a trigger, though, even with the sort of help Heath had. The loud report of gunfire echoed off the buildings lining the street. Another followed a second later, and Eustace went down. Itching burned across Heath’s chest, but he ignored both it and the wave of exhaustion that washed through him. He holstered his gun as he patted Murdoch. It was a good horse who didn’t shy during gunplay—or a deaf one. He hadn’t owned Murdoch long enough to be certain which he was. As Heath dismounted, a flat disc of lead tumbled out of the folds of his shirt. He stooped to retrieve it from the dirt and deposited it in his pocket, forcing himself upright despite his trembling legs. It wouldn’t do for someone to find the disc and figure out what had happened. He checked again that his sleeves were all the way down and his shirt buttoned all the way up, just to be sure. He thought the Mark of Warding could take another shot or two, but it was best not to give anyone else a reason to shoot him. You'll have to buy the magazine to read the rest (no free version this time around).